Flat roofs are common across the UK, particularly on garages and extensions, largely due to their low cost. 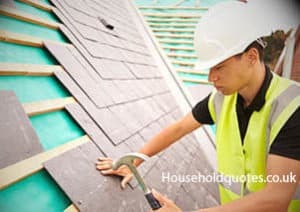 However, they are notorious for leaking, so you should be prepared to either patch or replace your roof every 15 years or so. Maintenance costs shouldn’t be that expensive, and your roof should keep out the weather for years to come. But beware the all too common bodge jobs; these won’t only damage your bank balance, but your home too. Despite the name, flat roofs aren’t actually flat but pitched at a small angle. If they were completely level, water would pool on the surface of the felt, degrading the material and leading to leaks. Most roofs are covered in felting has got bitumen on the rear side. When a blowtorch is used, the bitumen melts slightly and becomes attached to the wooden roof structure. Unfortunately, until felting is torn off, there’s no easy way to establish if the wooden struts and beams need replacing too, so you must consider the extra cost of this when you budget repair and replacement costs. In these cases, you might be able to get away with a small fix. This is normally an easy DIY job, and you can repair your flat roof for less than £50 if there are only a small few tears or cracks. If your garage roof is leaking significantly, you’ll have to get it replaced. You can use a site like Rated People to find a contractor who will come and remove any stone chippings and existing felt, inspect the roof timbers and, if these are not rotten, install the new roof. This includes adding an underlay to the existing timber decking, fitting the new felting and installing drip edges and upstands. Your builder should also take any waste materials away for you. For an average double garage with four walls, quotes should be in the region of £750 to £1,000 outside of London, and between £925 and £1,300 in the capital. The cost of replacing a flat roof on an extension is, unfortunately, higher. However, it’s worthwhile paying the extra cost if you don’t think a patch job will work because the last thing you need is a flood every time it rains. On an extension, there’s often poorer access and scaffolding may be required. In addition, due to the join with the main property, you’ll need to have lead overlaps installed as well as wall upstands. If it’s not a first storey extension, it’s also harder to remove waste material, and because it’s a habitable room beneath, additional felting and insulation are required. When all of this is taken into consideration, the average cost for a roof that’s approximately 1.5m larger than a double garage roof should be between £975 and £1,500, with prices in London around £500 more. If the felt’s pulled back and you discover rotten timber, you’ll have no option other than entirely replacing a flat roof. In many cases, flat roofs are installed as a cheap and short-term option. As a result, low cost chipboard or ply is often used. Replacement decking timbers of a decent grade will cost between £40 and £55 each, including their installation. If you realise that water’s pooling on your roof instead of running off into a gutter, it’s essential that you have the pitch altered. Luckily this only requires a couple of inches of timber and shouldn’t increase costs too much. It’s important to seek advice from your builder as to how much the roof should be elevated, and it’s a job that shouldn’t be put off as standing water will destroy felting quickly. Flat roof replacement costs can vary wildly because there are many different factors. For example, you might not like the look of felting and want stones or chippings added. This can also protect the felting material from UV light, prolonging its life as a result. In addition, if it’s an extension roof, you have to pay for costs of insulation too. There are many builders out there who, unfortunately, will offer to fix or replace your roof without really knowing what they’re doing. It’s important you don’t allow contractors to leave existing felt in place and simply cover it over, not only because the resulting seal isn’t tight, but because you can’t inspect the roofing timbers. In addition, be wary of anyone who says they’ll seal your roof with liquid tar. This will only last a couple of years at best before cracks and splits allow water back in. The most important piece of advice is to ask your builder questions so you know what your quote includes. Will the old felt be removed and new felt added? Is there a separate breakdown of timber costs if they’re needed? Will old materials will be taken away? And, if required, how much will scaffolding cost? By asking the right questions, you’ll have peace of mind that, once done, you’ll have a weather-proof home to enjoy for years to come. Get Your FREE Flat Roof Quotes NOW!